A little over a month ago, I posted about my new scrapbusting project, the Briochevron Wrap. I have continued to work on it in fits and bursts. 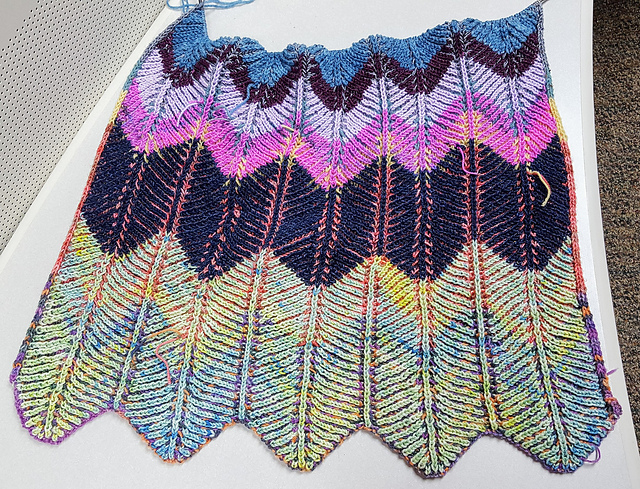 It is my default background project, but it is currently my most active WIP because I have wanted to take a little break from the sleeves on my Lopi sweater. I have more than doubled the size of the wrap since I last posted, but I still have a loooong way to go. I believe the prescribed length in the pattern is 89 inches. I know I’m no where near that, so I am not measuring! I’ve been selecting smaller scraps lately in an attempt to feel like I am making more progress, since it means I use up a scrap every few repeats. I’m using magic knots to connect the scraps and have yet to trim them, which is why you can see short little ends flopping around in these pictures. 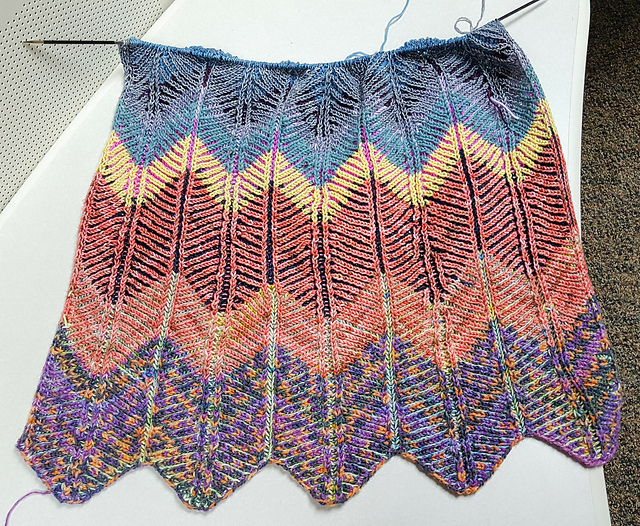 I know it will be a long time before it is finished and I will probably set it aside again soon to get back to finishing some other things, but I remain addicted to brioche and have had a blast working on this almost exclusively the last few days. Even though it’s not a blanket, it is getting big enough to warm my lap while I work on it! This looks great and super squishy! I’ve heard the term “magic knot” before, but I’m not sure I’m familiar with it. Do you have any good links you could point me to?